Introducing the latest development in RF spectrum monitoring -- Clear Waves is the next generation of PC-based, RF spectrum analyzer for the wireless pro audio and video industries that offers automatic charting of open white space, frequency coordination and channel assignment. In a hostile RF environment why leave your wireless planning to chance ? Take the guess work out of configuring your wireless audio gear -- Clear Waves enables you to choose the optimal channel assignments -- free of RF interference and intermodulation distortion (IMD). Clear Waves offers detailed RF spectrum scans using easy-to-view, graphical displays, along with interference-free channel assignments. Real-time RF spectrum analysis combined with our intermodulation distortion (IMD) module delivers optimal channel assignments for even the most demanding RF environments. The Clear Waves software runs on any model RF Explorer -- regardless whether the device was purchased from us or elsewhere. You can purchase the Clear Waves software alone or discounted when packaged with an RF Explorer spectrum analyzer. By the way -- for evaluation purposes, feel free to download the Clear Waves software application. Without an RF Explorer device the software still runs in a fully functional ‘Demo mode’ using simulated data. Using an RF Explorer or RF Viewer spectrum analyzer for data acquisition, Clear Waves performs RF spectrum scans and intermodulation analysis in realtime, computing an intermod-compatbile frequency set after each spectrum trace. You can specify up to 160 different frequencies to monitor -- either to ensure those channels are not being impacted by RF interferers or you wish to monitor known signals. Five diagnostic charts aid you in monitoring the RF environment and choosing the optimal frequencies to assign to your wireless transmitters. Export spectrum traces in XML or CSV format for use in 3rd-party applications -- e.g. Shure's Wireless Workbench, Professional Wireless' IAS. Create reports in PDF format that include the current diagnostic charts. Employing the RF Explorer broadband RF spectrum analyzer as our hardware platform -- we've developed Clear Waves as the next generation of PC-based, RF spectrum analyzer specifically designed for the wireless professional audio and video industries. Clear Waves is built upon the success of our award-winning White Space Finder RF spectrum analyzer which was the industry's first, PC-based, RF spectrum analyzer to offer automatic charting of open white space (open RF frequencies) and intermodulation analysis for use with wireless microphones, in-ear monitors, remote control, security, access control, etc. 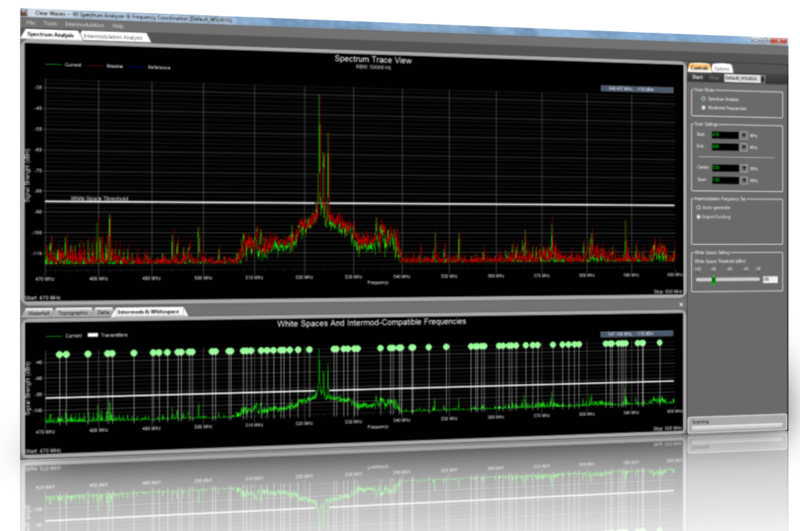 Automatic charting of open white spaces (RF frequencies) in a real-time RF environment. 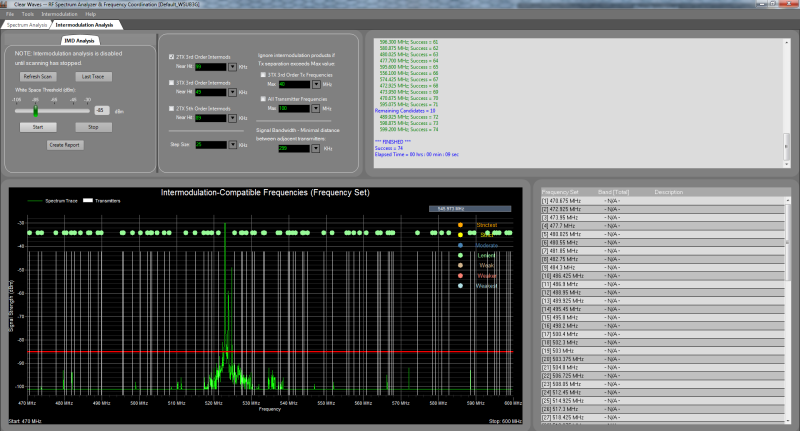 Combines RF spectrum analysis and intermodulation analysis in a single tool. Graphical UI that is easy to use; lays-out the relevant data in a clear, concise way. Fast data acquisition, display, and channel assignments. Sets up the RF spectrum analyzer with proper default settings for span, RBW, scaling, and sensitivity with minimal user input. This allows users with little to no experience with spectrum analyzers to get right to work. User-definable threshold for open white space. Clear Waves continuously scans and samples the signal strength (dBm) of frequencies in the range the user has specified. In the 'Spectrum Trace' view the signal strength data (in dBm) is displayed as a function of frequency. The 'Waterfall History' view is also known as a "heatmap" graph. It provides a color-based visualization of the RF level and activity over time. As signal levels for specific frequencies or frequency ranges increase and decrease, the waterfall map varies its colors. This feature provides a quick glance back into the sweep history to identify aberrations or fluctuation in frequency levels. The 'Topographic Map' chart shows accumulated RF energy as a function of frequency. The power of the signal strength in dBm is shown across the frequency span. A signal strength with a relatively low occurrence is 'blueish' in color, whereas increasingly brighter colors are used for signal strengths that occur more frequently. Signal strengths that occur most often are 'redish' in color. Over time, this spectral view will approximate the steady-state RF energy signature of a given environment. The 'Delta Trace' view can be used to view small (or large) changes in the RF spectrum over time. Here's how it works... When scanning begins the first trace is saved as a 'snapshot'. For all subsequent scans, the snapshot trace is subtracted from the current trace and the difference, i.e. 'delta', is displayed. Plotting the data in this way makes it easy to detect RF changes that occurred since the initial 'snapshot'. 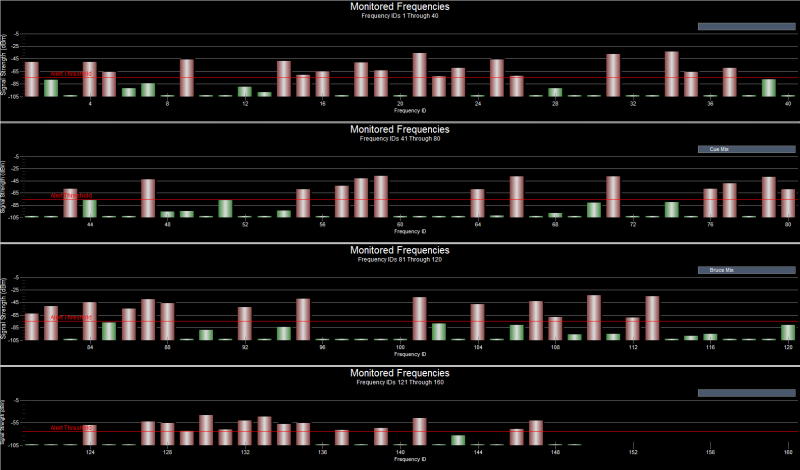 'Monitored Frequencies' mode allows you to monitor specific frequencies. For example, in the setting of a live performance where it is important to monitor the channels that have been assigned to wireless audio devices, this feature can be used to ensure those channels are not being impacted by other sources of RF transmissions. Alternatively, if there are wireless devices that transmit at specific frequencies and you wish to monitor their transmissions, then this mode can be used to verify they are currently operating. This feature is used for locating open frequency space in crowded RF environments or used to assist in properly spacing transmitters for frequency coordination. Using parameters that were set in the Control Panel a user specifies a signal strength to be used as the 'White Space Threshold', the minimum open space required for each transmitter (bandwidth), and the minimum spacing between adjacent transmitters (band-guard). The open spaces are then graphically displayed. It's designed for locating open frequency space in crowded RF environments, or to help insure proper spacing for frequency coordination. The Intermodulation Distortion (IMD) module can also be applied to obtain optimal channel assignments for your wireless audio gear. Utilizing the existing hardware platform offered by the RF Explorer spectrum analyzer, Clear Waves was designed with sound engineers in mind. The software and documentation included with Clear Waves allow even a novice user to get up to speed in no time and start making informed decisions about frequency coordination. Though many of its features are well suited for wireless professional audio production, Clear Waves is a sensitive and accurate, broadband RF spectrum analyzer that is an excellent tool for general commercial and industrial RF work where the goal is to monitor for RF interference and coordinate multiple wireless transmitters. Compared to earlier versions of the product -- IW1800 and IW3500 -- Clear Waves is a much improved product, yet it sells for less. The main improvement is in the hardware that is used. The RF Explorer RF spectrum analyzer used with Clear Waves is much superior to the WinRADio scanner used with the earlier product. RF spectrum and intermodulation analysis in a single tool. Supports a broader frequency range. The RF Explorer devices are true spectrum analyzers and scan more than 100x faster than a WinRADio scanner. This means more data points can be collected per trace, which also translates to greater accuracy. The RF Explorer spectrum analyzers connect to a PC (laptop or desktop) via USB cable -- which is used not only for communication with software running on the PC, but also for power. The WinRADio scanner required either an external power pack or an AC adapter plugged into a wall outlet. Clear Waves is a unique tool. There is no other product on the market that combines both real-time RF spectrum and intermodulation analysis with automatic charting of open white space and optimal channel assignments. Affordably priced (beginning at $295 USD), Clear Waves is a "game changer" -- imagine no more guess work when it comes to configuring your wireless gear.